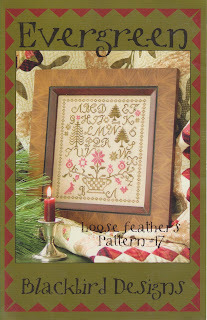 I was fortunate to win this chart in a giveaway from Sue as she celebrated the beginning of this wonderful blog. Now that I have finished stitching it, I thought it only fitting that I now pass it along to another BBD fan! OOh, so pretty! May I be entered into the drawing? Thank you. It's absolutely beautiful! I would love a chance at this wonderful chart! Thank you! I love your finish. I would be proud to stitch the chart and hang it in my home. What a beautiful job you did stitchin this. I would love the chance to win the chart. Ahhh, Kudzu-very versatile and a must in my floss stash at all times, one of my favs. Plz give to chance to another. Just wanted to say what a nice finish, beautiful. Would LOVE to stitch that design up. And what a great idea to pass along the pattern! What a wonderful thought and gesture. I would love to enter but have stitched this chart myself. Good luck to all those that would like to win it. It's a fun piece to stitch. What a beautiful work! And how kind you are for making this giveaway :) I'd like to be entered, thank you! Well done on completely a gorgeous stitchery. I would love to enter the comp. What a super finish!!! I would love to have my name thrown into the drawing. I love your finish on this one. I would love to be included in your giveaway for the pattern. Beautiful stitching !!! Thx for passing along your pattern to another BBD fan. Super finish! I just adore the colors. Please include me in the giveaway contest. Thanks!! How beautiful yours is and what a thoughtful gesture to pass it along! Thank you for the chance to enter your drawing. A lovely design and you have stitched it beautifully. Please enter me in the drawing. Sweet colors, a nice pattern to do a quickie! Beautiful stitching, Karen! I love BBD designs, would love to win this chart. Beautiful, I would love a chance to win!! Beautiful stitching job. I hope I win. Your stitching is beautiful. How generous of you to pass on your good fortune of winning! Please enter me in the draw...and if I am the lucky person to win, I will pass it along as well! Please pick me! I love it-it kind of looks Irish and I love anything Irish. I would love a chance to win your leftover chart. Your stitching came out great. Karen, your Evergreen looks wonderful, well done. I would love to be entered in the draw for the chart please. My email address is in my profile, should you need it, and I hope you will. This is lovely! Please add my name to your drawing. Thank you. You've done a wonderful job, I would like to stitch this one too. So I'll give a try I might be lucky! I would love to win and stitch evergreen. What a beautiful idea! Please count me in!